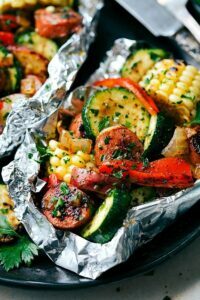 Andouille sausage, veggies, uncooked rice, and a delicious spice mixture — throw it all together in some tin foil and forget about it! I can’t believe the summer is nearing an end. Even though it isn’t necessarily done until mid-September, it always feels like its done when school is back in. (Even though I’m personally not going back to school ha!) So even though I’d consider this more of a summery recipe, I also think its a perfect back-to-school weeknight dinner. It’s totally simple and so fast to assemble that it’s a recipe you’ll love to have with the craziness of everything that accompanies “back to school” time. The toddler will be starting pre-school this year which already has made me a total train-wreck. How is he so grown up already?! I’m totally anxious about the whole thing even though its only a few hours a few times a week. We got him all enrolled and set up this past week and I’ve told the husband that I will probably cry the entire time he’s gone for his first day. 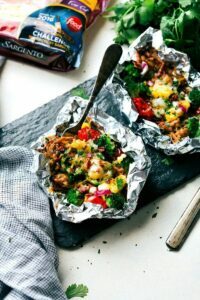 So comfort food tin foil dinners are a must have. So, Jambalaya. I adore it and so do my boys. But lets get this out right away: I am making NO claims to authenticity with this Jambalaya, because, well for starters it’s made in tin foil. ? This isn’t meant to be super authentic, spend all day on it, kind of ordeal. 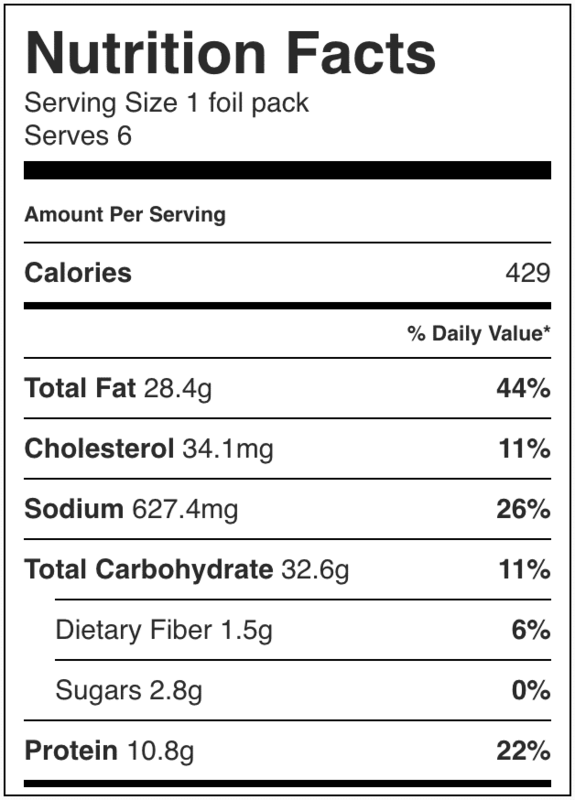 BUT it does have a lot of the same ingredients and flavors so I figured it is close enough to call it a Jambalaya. 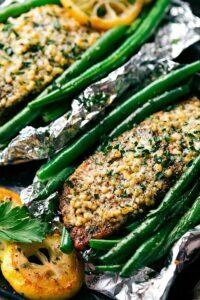 The whole purpose of a tin foil dinner is to make your meal extremely simple, limit the clean up (like a lot), and still have a nice tasty dinner. This recipe is all of the above. You will not believe how easy this is to make and the flavor is incredible! So let’s just quickly walk through the prep to show you how easy this is to make. Start by tossing together your instant rice with chicken broth. The rice soaks for a bit to get it nice and tender so it will cook evenly with the other ingredients. Next toss together the spices with the olive oil (this can even be done in the same bowl as all of the veggies to save a dish!) As far as spices, you will want to adapt them a bit to personal preference. We like things a bit spicy around these parts, but don’t be scared away by the spice, because you can absolutely make it more mild. To make these more MILD: reduce the cayenne pepper (try 1/4 teaspoon or omit entirely), don’t add a jalapeno, and reduce the cajun seasoning (to 1/2 teaspoon). With a reduction of spice you will likely want to make up for the spice by adding some more salt, pepper, and dried herbs. Want it SPICIER? add a jalapeno (it’s listed as optional in the recipe), and increase the cajun seasoning to taste. After tossing together the spices with the oil, prep the veggies. Just do a quick coarse chop of an onion and bell pepper and thinly slice a celery. The zucchini is an optional addition and can be switched out for a wide array of vegetables for whatever is in season or available. Quickly slice up the sausage and then toss everything together: the soaked rice (do not drain off any leftover broth), the spice mixture, and the veggies + meat. A quick toss and then separate the mixture evenly among tin foil packets and its ready to be grilled or put in the oven. I’ve tried these on both the grill and the oven and both are great, but I do prefer the smoky flavor of the grill. Alternatively, we’ve also cooked this all up on a skillet to make a one skillet meal. Prep it all the exact same way and then throw it all on a large skillet and cook it over medium heat stirring occasionally until the rice and veggies are tender. If you cook it on the skillet you may need a little additional olive oil and it does end up spicer than in a foil packet so be aware of that. In a small bowl mix together the uncooked instant rice and chicken broth and let stand about 10 minutes. You do not need to pre-cook the rice at all. Preheat the oven or grill to 400 degrees F.
In a large bowl add the olive oil, cajun seasoning, cayenne pepper, dried parsley, thyme, sage, about 1/4 teaspoon salt (I like seasoned salt in these), and a pinch of pepper. Stir. Very thinly slice the celery, finely chop the onion, chop the pepper, and thickly coin the zucchini. Drain the diced tomatoes. Slice the sausage. Add the celery, onion, pepper, zucchini, tomatoes, and sausage to the seasonings. Add the tomato paste and mix until all ingredients are well combined. If you LOVE heat, add a diced jalapeno into the mix here. Place 2 pieces of heavy duty foil in the shape of an X. Lightly spritz with cooking spray so the rice won't stick. Put a generous amount of the mixture (~1 and 1/2 cups) in the center of the foil and seal 100%. Place in the oven or on the grill for 25-30 minutes or until rice is cooked through and veggies are tender. Remove and enjoy with fresh chopped parsley if desired. If you are worried about spice, do not add in the jalapeno, reduce or omit the ground cayenne pepper, and reduce the Cajun seasoning to taste. Such a great idea, Chelsea!! 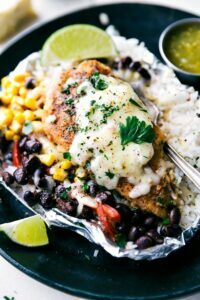 I grew up eating a lot of Cajun food so this quick and easy dinner idea is a must. Can’t wait to try it. 🙂 Best of luck with that first day!! Thanks so much London! 🙂 Hope you love this! Step 9 says to put ~1.5 cups of the mixture onto the foil and seal. Do I put another ~1.5 cups of the mixture onto another piece of foil?? What do you do with the rest of the mixture? Quite liked this recipe, but was disappointed with how much waste there was with the tin foil. Seems like a huge waste in resources and rubbish going to landfill. For this reason would not make again. We made this last night and LOVED IT. Both my husband and I were scraping our plates. We did the full on spicy version 😉 I also forgot to buy minute rice at the store so I just made some brown rice in a pot and added it into the foil packs in the last 10 min of oven time. I think it still worked well – just a little extra work! We will be making this again very soon. This was DELICIOUS! Great Recipe, My husband and I loved it. Great work!